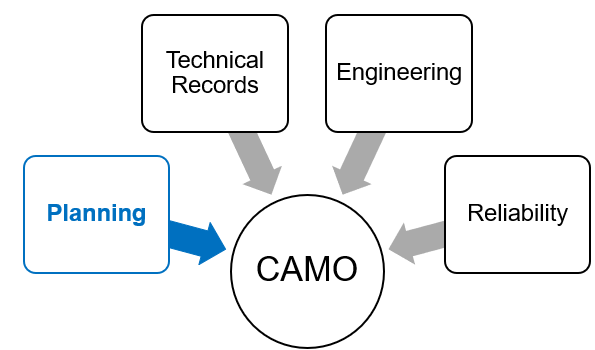 The Continuous Airworthiness Management Organization “CAMO” is essentially responsible for 4 primary functions Planning, Technical Records, Engineering, and Reliability, these groups work together to ensure that the Aircraft remain fully compliant with all requirements concerning the aircraft maintenance management and associated oversight. Within the CAMO the Maintenance Planning, Technical Records, Engineering & Reliability groups work together to ensure that the aircraft remains fully compliant with all requirements concerning the aircraft maintenance management and associated oversight. To ensure the aircraft remains fully compliant with the Maintenance Program. Driven by: ADs, Modifications (Mods), Service Bulletins (SBs) and Deferred Defects. Very “Ad Hoc” in nature!! The activities contribute an additional dimension which complicates the planning process. Together with the fixed workload, there is an associated and variable workload driven by Airworthiness Directives (AD’s), Modifications (Mods), and Service Bulletins (SBs) and Deferred Defects. Because of the “Ad Hoc” nature of the activities, an additional dimension is added which complicates the planning process. It becomes more challenging for the planning process both in terms of maintenance planning and production planning. Repercussions which impact other elements of the maintenance activity. Draw on additional expertise provided by Engineering or Technical Services departments. It is mandatory that we comply fully with the requirements of the directive. Sometimes the compliance requires a detailed understanding of the component configuration within the aircraft system. For this reason, it is usual to involve a technical expert group. the more effective will be the performance of the task. • the number of times the task is going to be performed across the fleet.